Sometimes size matters. But when neither your size nor your bark are intimidating, you have to resort to a third option: attitude. This little Chihuahua has plenty of it, as displayed in the video above. 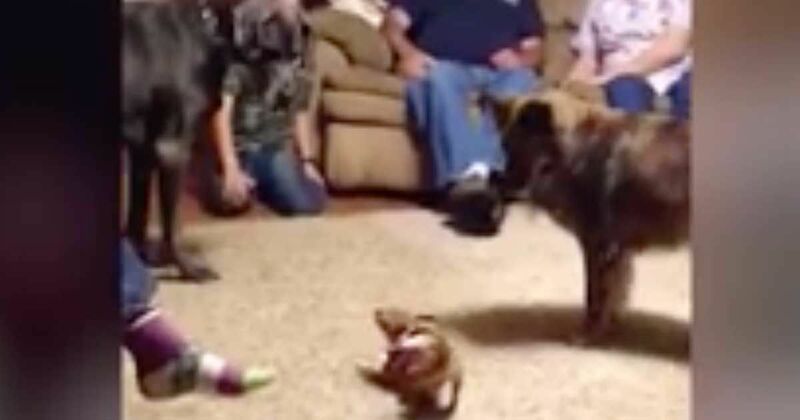 At a family reunion, the 3.5-pound pet gets to meet the other two dogs in the family for the first time, and things don't go quite as expected. Duke, the massive Great Dane, is somehow terrified of the tiny little guy commanding center stage. While Great Danes are among the largest dog breeds around, they are surprisingly docile and friendly, especially with children, Dogtime reports. Though originally designed to hunt for prey, the breed has evolved since then to be much more of a companion animal, and its features, while imposing, are now mostly relied on for face-value intimidation alone — though it seems this little Chihuahua knows better. Watch the hilarious confrontation below and make sure to SHARE it with your friends on Facebook!